Saturday Night Live is a 90 minute skit comedy series on NBC where a regular cast of comedians poke fun at famous personalities and current events. As of the end of the 2009-2010 season, announcer Don Pardo has been with Saturday Night Live longer than anyone else. He has been onboard for the entire run except for season seven. Even Executive Producer Lorne Michaels has four fewer seasons on staff than Don Pardo as Lorne left the series for five seasons from 1980-1985. Don also holds the distinction of being one of only two people to ever get a lifetime contract with NBC! The other person was Bob Hope. Darrell Hammond is the longest-lasting cast member at 14 seasons on Saturday Night Live! He also holds the record (as of 2010) for introducing episodes by saying, "Live from New York, it's Saturday night!" more times than anyone else with an astounding 69 times. On May 15, 2010 Alec Baldwin tied Steve Martin's long time record as the person who hosted the greatest number of Saturday Night Live episodes. As of that date they each had hosted fifteen times. In fairness to Steve Martin, however, he appeared on the show several other times when he didn't host. By the way, contrary to popular belief, Steve Martin was never a regular cast member. Conan O'Brien appeared in several sketches during his time as a comedy writer on the show from 1988-1991. That's by no means unprecedented. Steve Martin did the same thing in the mid-1970s while he was a writer on the Sonny and Cher Comedy Hour. 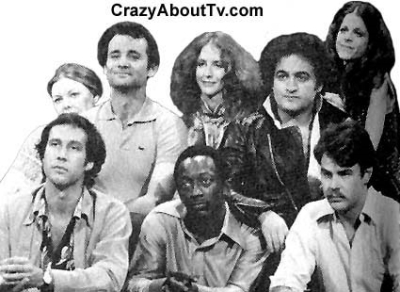 Thank you for visiting our Saturday Night Live Cast page!